You have to love it when research studies come out and prove what you believed all along. I had this experience when a systematic review and meta-analysis (looking at the results from multiple studies simultaneously) in Emergency Medicine Journal in September 2016 (1) compared the speed of glucose tablets against dietary sugars for treating hypoglycemia in adults who had symptoms of being low. The dietary forms of sugar tested included sucrose (table sugar), fructose (fruit sugar), orange juice (containing fructose), jellybeans, Mentos, cornstarch hydrolysate, Skittles, and milk. In other words, glucose worked faster in resolving symptoms of feeling low—and who wouldn’t want to treat a low as quickly as possible? Why does glucose work faster? It’s because glucose is the actual sugar in the blood that you’re trying to raise. There are three simple sugars in our diet: glucose, fructose, and galactose. Sucrose (table sugar) is a compound sugar that is only half glucose, half fructose. As shown by its glycemic index, fructose raises blood glucose much more slowly than glucose, likely because fructose has to be converted into glucose. For this reason, juice is not an ideal treatment for hypoglycemia, and it’s very easy to consume too much of it. Milk can also act more slowly (especially if it has any fat in it) because lactose (milk sugar) is half glucose and half galactose. Some people say that other treatment options work better and faster for them than glucose. That’s not surprizing since even this meta-analysis found that neither glucose nor dietary sugars reliably raised blood glucose levels to normal within 10 to 15 minutes. Since lows occur for all sorts of reasons—including missing a meal, exercising, overestimating insulin needs, and more—how you best treat it depends on a number of factors, and not all treatments are going to work the same in every situation. The rate at which your blood glucose reaches hypoglycemic levels will also vary, as will how low it goes and how long it will continue to drop. 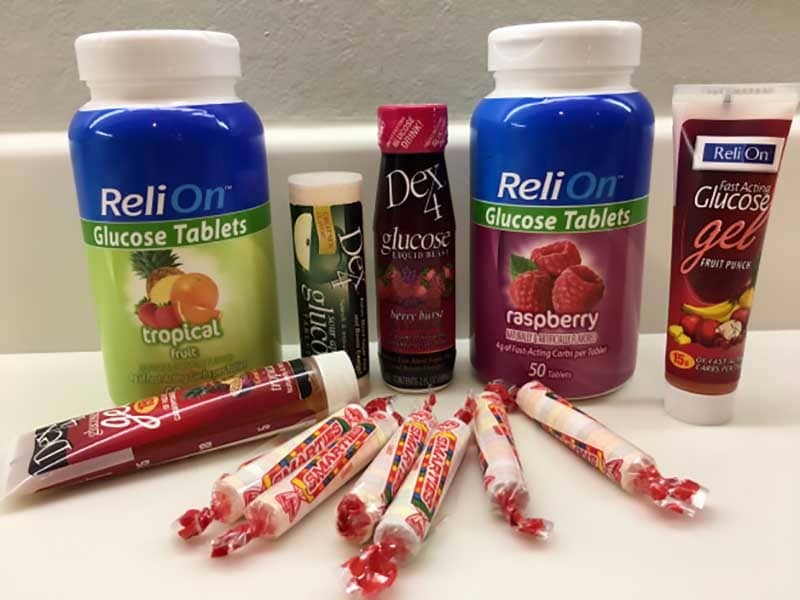 If you have some glucose handy, though, the fastest way to initially bring up your blood glucose is likely by consuming some straight glucose, which you can get in glucose tablets and gels, Gu (maltodextrin), Gatorade and other sports drinks (glucose polymers), and even Smarties candy (dextrose, another name for glucose). You may have to follow glucose intake with more glucose, another carb snack, mixed nutrient snack (with some fat and protein), or a full meal, depending on why you went low in the first place. Not taking in any more calories than necessary. For these reasons, I recommend using at least a small amount of glucose to initially relieve your immediate symptoms and then deciding—based on when you last ate, what you ate, how much insulin you’ve had, activity levels, etc.—if you need to follow up that up with anything else to fully resolve the low, prevent it from recurring, and not overshoot your blood glucose target. Honestly, there’s nothing worse than feeling low for a long time, except for maybe ending up high later after you’ve eaten everything in sight. You also don’t want to gain excess fat weight from having to treat too many lows or from overtreating them (requiring more insulin later to bring down highs). Treat them with as few calories as possible for all these reasons! Be prepared and always carry some glucose with you, along with other snacks. Suggested next post: Insulin & Weight Gain: Does Tighter Control Make You Loosen Your Belt? 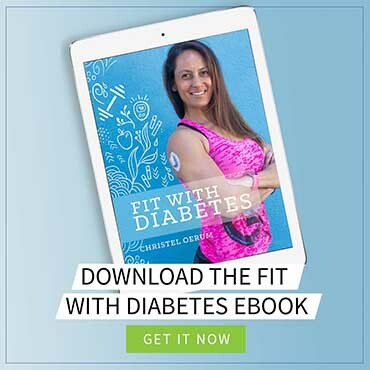 Sheri R. Colberg, PhD, FACSM, is professor emerita of exercise science from Old Dominion University and author of The Diabetic Athlete’s Handbook. 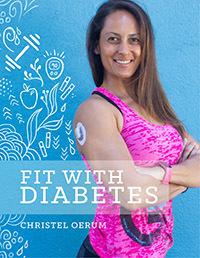 A graduate of Stanford and Cal Berkeley, Sheri is a world-renowned expert in exercise, diabetes, and healthy lifestyles. You can learn more at shericolberg.com and diabetesmotion.com. Thanks very much for your article, which is extremely relevant for me. Although I am not on insulin or any meds except 2g Metformin daily I have recently twice seen 3.8 and 3.9mmol/L (68.4 and 70.2 mg/dl) on my meter, so I am suddenly trying to learn about dealing with hypos! I suffer from delayed stomach emptying, so I think I might have more chance of correcting a low bg quickly if I used a glucose syrup rather than tablets. Could you comment on this? The syrup I have found is sold for baking, not specifically for diabetics. It is Dr Oetker’s glucose syrup in a 40g tube and contains 81g carbs per 100g product. I’m not familiar with those, but would also think liquids would be the optimal solution for you. Since you’re looking for liquid you could also choose honey or simply dissolve glucose tabs (or powder) in water.